Bioterrorism -- real or imagined? 1. Bioterrorism -- real or imagined? Crop duster like this seem ideal for spreading biological weapons. POSTED 4 OCT 2001, UPDATED 8 OCT 2001 And a splendid fall day was split by the indelible image of jetliners incinerating office towers and office workers. Whatever their motive, whoever their leader, the terrorists blended a disturbing level of determination, savagery, and technical prowess into a witches' brew of evil that will forever change the world. Having mastered the "art" of turning hijacked airplanes into guided missiles, will the terrorists top their "success" by using biological weapons? The threat is in the air, certainly. Bob Stevens died of anthrax in Florida on Oct. 5th, and a second man is infected. Environmental tests inside the American Media, Inc. building in Boca Raton confirmed the presence of the anthrax bacteria, and more than 300 employees were asked to visit the health department for testing and antibiotics. We're told it's an isolated case, not terrorism. But anthrax is normally a cattle killer, not inhaled during a normal day at the office. Contaminating a building with lethal biological agents is a potential route for bio-terrorist attacks. In mid-September, federal authorities grounded crop dusting airplanes, fearful they would be used to spread biological or chemical weapons. Indeed, a crop duster spreading antibiotic resistant anthrax over a crowded football stadium could kill even more people than the jetliner attacks. The grounding was a response to reports that about a dozen Middle-Eastern men had asked about crop dusters in Florida, particularly about fuel and chemical capacities. If the men were indeed terrorists, there's no proof that biowar was on their minds: they may have wanted to load the planes with fuel or chemical weapons. The New York Times, in its Sept. 25 web edition, noted that Attorney General John Ashcroft had told Congress that "a search of computers, computer disks and personal baggage of another individual in custody revealed the significant amount of information downloaded from the Internet about aerial application of pesticides, or crop-dusting." But if you consider the disturbing evidence that terrorists and "rogue states" are fascinated with bio-weapons, you can't rule out the horrifying prospect of terrorists striking with deadly disease rather than jet fuel or nerve gas. Crude bio-weapons are rather easy to make, writes Harvard terrorism expert Jessica Stern. She cites a U.S. study showing that a few biologists, with $10,000 worth of equipment, could crank out enough biological weapons to do major harm (see p. 50, "Ultimate Terrorists" in the bibliography). Iraq, Iran, Libya, Syria and North Korea -- all considered supporters of terrorism -- possess chemical weapons and some biological weapons. Aum Shinrikyo, the Japanese cult that killed 12 with the nerve gas sarin in the Tokyo subway in 1995, sought ebola in Africa. This deadly virus kills via massive bleeding. 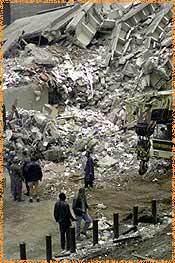 Bombings in Nairobi, Kenya and Dar es Salaam, Tanzania August 7, 1998. Was this warning about future terrorism heeded -- or ignored? The Soviet Union ran a giant biological weapons program until at least the early 1990s. Secret cities in the "Biopreparat" bureau handled research and production, flouting the biological weapons treaty. According to Ken Alibek, the former deputy chief of Biopreparat, 60,000 to 70,000 people made pathogens by the ton. Scientists trained in the Soviet program pose probably the biggest biowar threat: hungry, demoralized, and full of lethal knowledge, they could arm terrorist groups with the "best" of the awesome Soviet stockpile. The warnings about biowar can make a sane person paranoid. Do the fleas carry plague? Anthrax or tularemia in the air? What damage could be caused by an envelope of living, powdery death? As the scare over bioweapons gathers steam, some experts note that we have yet to witness a large-scale attack, which could indicate that bioweapons are simply too complex for terrorists to develop by themselves. Biowar. Suitable for the do-it-yourselfer?